The Enemies of the Iranian People since 1979. Are appeasing the Terrorist Mullahs In Iran. They call it constructive engagements!!! for the human sufferings in Iran. Rule Iran by fear and terror. Imprison, torture and kill your own people every day as you did for the past 26 years. Destroy Iran's economy Like you have done so far. Rob Iranians of their wealth and future. Promote terror and mayhem in Lebanon and Palestine. Singe lucrative deals to the benefit of Europeans and the disadvantage of Iran. But Do not become Nuclear power. Public hanging of young men and women. The Iranian people possess the fundamental and genuine legal right to liberate their homeland. The people will determine their attitude toward all states and forces on the basis of the stands they adopt vis-�-vis to the regime change to fulfill the aims of the Iranians. London, Jul. 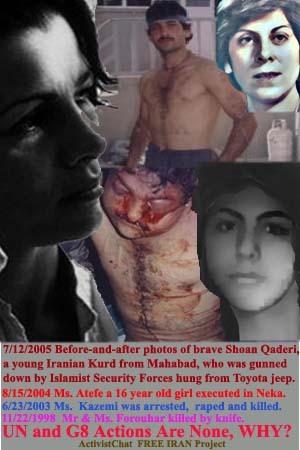 14 � Iran Focus has obtained several before-and-after photos of Shoan Qaderi, a young Iranian Kurd from the north-western town of Mahabad, who was gunned down by State Security Forces and then hung from the back of a Toyota jeep which was driven in nearby streets on Sunday. According to witnesses the act was carried out because Qaderi was active in anti-government protests and authorities wanted to intimidate the local population to prevent further demonstrations in the volatile city. Minutes after Qaderi�s body was dragged throughout the town, several hundred angry residents gathered in nearby streets and started to chant anti-government slogans. Mahabad, Iran, Jul. 12 � Iran�s State Security Forces on Sunday opened fire at youths in the north-western volatile Kurdish town of Mahabad, leaving one young man dead and several others injured. A group of friends were walking at an avenue in Independence Square in Mahabad at 22:30, when they were approached and attacked by an SSF convoy, plain-clothed Islamic vigilantes, and a number of agents of Iran�s dreaded Ministry of Intelligence and Security (VEVAK), according to several eye-witnesses. The SSF fatally shot a young man by the name of Shoan Qaderi and critically injured two other individuals. The security forces then proceeded with tying Qaderi�s body to a Toyota jeep and while driving dragged it in streets, according to the witnesses. �This barbaric and inhumane act was carried out to scare everybody so that they stop their anti-government protests�, said one witness, who requested to remain anonymous. �Shoan was always active in demonstrations against the regime. Whenever there was a protest, he was always on the frontlines�, said another witnessed, who claimed that he was a friend of Qaderi. Minutes after Qaderi�s body was dragged throughout the town, several hundred local angry residents gathered in nearby streets and started to chant anti-government slogans. Anti-riot police were brought in from the neighbouring towns of Miandoab and Naqadeh to stop the escalation of protests. Several large anti-government demonstrations have rocked the town of Mahabad in recent month. Residents believe that with the arrival of ultra-conservative Mahmoud Ahmadinejad as the new President of Iran, security forces will have a freer reign to suppress dissent. Ahmadinejad recently rejected a request by Kurdish Members of Parliament to allow ethnic Kurds into his cabinet. Topic: Human Rights conditions and deterioration of the situation of political prisoners and Human Rights activists in Iran. My compatriots and I are greatly concerned about the ever-increasing violation of human rights conditions in Iran. Various Iranian ethnic groups and women have stood out as targets of the Islamic Republic. The recent brutal murder of the Kurdish activist, Mr. Shwaneh Ghaderi and the imprisonment of Dr. Roya Toloee, a leader of Iranian women�s movement, are vivid examples of such violations. On numerous occasions I have issued statements or sent urgent letters to Your Excellency stressing the dire conditions of my compatriots jailed, maimed or tortured in my country. Allow me now to personally reiterate my deep concern about their dire situation and in particular about the condition of Mr. Ganji a well-known journalist and Mr. Manoochehr Mohammadi a human rights activist who are both near death. But there are many others whose detentions and even executions have not been publicized. The victims include even children and minors. Many if not all the political prisoners in Iran are brutalized and held in solitary confinement in spite of the numerous specific recommendations of the United Nations to stop and put an end to such inhuman practices. Unfortunately the Islamic Republic of Iran has so far ignored these recommendations as well as all the urgent appeals made by international human rights organizations such as Amnesty International and Human Rights Watch. Despite the threats, human rights activists in Iran continue to fight for their freedom and human rights at the risk of imprisonment, torture, disappearance and death. I salute their courage and dedication. It is sad to notice that in spite of glaring evidence of all the misdeeds, international pressure on Iran including by the Western world has recently weakened considerably. It is also sad to notice that Western representatives in Geneva have decided, not to call for a Special Rapporteur on human rights in Iran during the last meeting of the U.N. Commission on Human Rights. Needless to say, that has led to the general belief that the present reluctance to investigate may be motivated by a desire to mute criticism of Iran while nuclear talks with my country continue. As we are all aware human rights and fundamental freedoms are one of the sacred basic purposes of the Charter of U.N. - thus I urgently request your Excellency�s kind personal intervention to put as much pressure as possible on the Islamic Republic of Iran to end such practices. Massive Clashes Continue in Mahabad !!! The unrest continues as thousands chant "Death to the Islamic Republic", "Death to Khamenei", "Shavane we will follow your path". Note: Shavane was the youth gunned down and brutally killed by the regime. Members of the special forces, the regime's 'plainclothes agents' and local mercenaries called "Chash heye Manjoor" fired tear gas and bullets into the crowd. The protestors were beaten brutally with batons, many have been injured. According to this report many of the regime's forces have also been injured and were taken to the hospital. Angry mobs have set fire to the streets with gasoline and cooking oil. Government buildings, Sepeh Bank. the National Bank, Tejarat Bank have alos been attacked and sustained damages. During last night's clashes 15 were arrested. Since the start of the protests over 250 have been arrested. 120 have been released after posting bail. Friday's protests continued till 2am Saturday morning. The regime has cutoff phone service to 2/3rds of Mahabad to prevent communication to the outside world. The remaining phone lines are heavily monitored. Telephone booths are currently the only means of contacting the outside world. Note: In another item I posted today, the same site warned about motorcycles stationed at bases in preparation for assaults and attacks on the people, and helicopters prepared for dropping bombs on the people of Mahabad. The 3rd item, in this emailed to Peykeiran section, is a short note about how motorcycles are used for attacking women and girls with acid, and also for arson. over 70 bikes are being deployed at stations and they are preparing helicopters forbombing of Mahabad. The following e-mail & its attachments are for your information. If the Western Press does not want to publish these horrible photos, then we have to publish them far & wide on the Internet. The world should see & know what kind of savages are ruling in Iran! Your help in this specific matter will be highly appreciated. This e-mail is sent to few thousand of our compatriots. The attached distressing pictures are not from Abu-Ghorreyb or Guantanama. Otherwise they would have been all over the Western media and Kofi Annan would have made a song and dance about them.. They show the pictures of a murdered Iranian pro-democracy secular activist. Thats why the Western media have not reported it. Kamal Seyd Ghader aka Showane was kidnapped in broad daylight in Mahabad and beaten and tortured to death by Islamic state's security forces..
As a result of Showane's horrific murder, the people of Mahabad and the nearby Bukan and Sardasht erupted in protest. Another youth and law enforcement officer were killed in the clashes. Tens were injured and around 300 people have been reported under arrest. Perhaps one day Kofi Annan will see these pictures and hear about the protests of the Iranian people. London, Jul. 24 � Britain issued a damning report on the human rights situation in Iran, stating that there had been �no significant progress� over the year, while human rights had �deteriorated further in many areas�. The British Foreign and Commonwealth Office wrote in its Human Rights Annual Report 2005, released on July 21, that punishment of children in the Islamic Republic was an �area of concern�, adding, �We have received an increasing number of reports of juvenile offenders being sentenced to death or lashing. In several instances, these barbarous punishments have apparently been carried out. 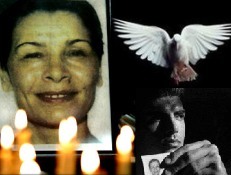 A 16-year-old girl, Atefeh Rajabi, was reportedly hanged in public in August 2004 for �acts incompatible with chastity��. The FCO said that such punishments violated Iran�s obligations under the International Covenant on Civil and Political Rights and the United Nations Convention on the Rights of the Child, adding that the UN Committee on the Rights of the Child had also made clear its concern earlier this year. �Sadly, we continue to receive reports of juvenile offenders receiving death sentences and we have asked the Iranian authorities to look into them as a matter of urgency�, the report said. �We remain concerned about the limits imposed on freedom of expression and assembly, the lack of freedom of religion and the extensive use of the death penalty�, it added. The annual report went on to highlight the Islamic Republic�s abuse of the right to free speech. �Iran has not respected freedom of expression. The government is increasing its censorship of all the main media and particularly the internet. It has blocked many websites and weblogs that provide news or comment critical of the regime and has closed down a number of reformist newspapers. The authorities have arrested and imprisoned journalists, internet technicians and webloggers�. �In late 2004 several webloggers claimed that they had been beaten, kept in solitary confinement and tortured. The government set up a presidential commission to investigate. A former vice-president of Iran said their testimonies had �made committee members weep�. Tehran�s chief prosecutor, Saeed Mortazavi, reportedly threatened those who gave evidence with lengthy prison sentences and harm to their family members�. The report also said that Non-Governmental Organisations had come under pressure. �The authorities have intimidated and arrested activists and human rights defenders, including some when they returned from conferences overseas�. Regarding the rights of women the United Kingdom�s annual report stated that discrimination was pervasive. �A woman�s testimony in court is worth half that of a man. Married women need their husband�s permission to get a passport and travel overseas�. The UK will make human rights a priority issue in its relations with Iran during its Presidency of the European Union in the second half of 2005, the report added. Reports from Mahabad state the repression reaching new proportions even beyond what was the norm in the past. The strikes and protests in Mahabad are now in its eighth day. In the last few days the state security forces have attacked the homes of Mahabad citizens, and arrested hundreds of the population. It is rumoured in the town that two youth aged 13 and 18 have died under torture. Thirteen of the tortured are in such a critical state that they have been taken to the hospital which is under the control of the military units. The city is now under complete general strike. Until 6:00 pm yesterday, large crowds had gathered outside the main prison demanding the return of the bodies of the murdered youth. In solidarity with the people of Mahabad, the near by towns of Bookan, Saqiz, and Kamyaran have also joined the general strike. While the new president, Ahmadi-Nejad, continues to flex his muscle, his crimes are going unreported. Not one Western correspondence as yet has gone to Mahabad to view the situation. Today, Reza Pahlavi issued a statement condemning the brutalities of the Islamic regime in Mahabad and supported the struggle of the Iranian Kurds against the oppression of the Islamic Republic. Tehran, Iran, Jul. 25 � Iran�s official news agency, IRNA, reported disturbances in the north-western Kurdish town of Sardasht, Western Azerbaijan, on Sunday evening. �Gatherings and disturbances took place on Sunday evening in the border town of Sardasht. The town returned to normal after State Security Forces intervened�, the news agency said in a dispatch on Monday. The report said that �troublemakers� set fire to tyres in the streets and set off sonic booms. Iranian officials and state-run media often refer to anti-government protesters as troublemakers. Sardasht and other Kurdish towns such as Mahabad have been the scene of widespread anti-government protests and clashes in recent days. Last night, demonstrators threw stones at the paramilitary police, according to the state news agency. The SSF launched a crackdown on protestors in an attempt to disperse them. Traffic came to a halt during the unrest, IRNA said. Sardasht has a population of approximately one hundred thousand people. Radio Farda: In the Iran Kurdistan region Uprising at least 4 killed on Monday By Islamist Security Forces, The Clerical Regime is very angry regarding distribution of Shoaneh Ghaderi photo as is shown below. ناآرامي در شهرهاي كردنشين غرب ايران كه در پي كشته شدن شوانه قادري در مهاباد آغاز شد، به طور پراكنده ادامه دارد. بر اساس برخي گزارش هاي بر اثر تيراندازي نيروهاي انتظامي ضد شورش جمهوري اسلامي در اشنويه، روز دوشنبه دست كم چهار نفر كشته شدند. در تهران روزنامه جمهوري اسلامي نوشت: سي دي هايي كه تصاوير خاكسپاري شوانه را منعكس مي كند و به طور گسترده در منطقه پخش شده، تقلبي است. علي جوانمردي روزنامه نگار كرد، در مصاحبه با راديو فردا مي گويد: در اين CD ها، صورت مثله شده و آثار شكنجه بر روي پشت و پارگي شكم و ماليده شدن پوست پشت شوانه در حين بسته شدن به پشت ماشين كاملا پيدا است و مقامات جمهوري اسلامي نيروي زيادي را صرف كشف منابع پخش و توزيع اين CDها نموده اند، اما واقعيت اين است كه اين سي دي ها كاملا درست است و در مهاباد فيلم برداري شده در حين شستشوي جسد شوانه. ناآرامي در شهرهاي كردنشين غرب ايران كه در پي كشته شدن شوانه قادري در مهاباد آغاز شد، به طور پراكنده ادامه دارد. بر اساس برخي گزارش هاي بر اثر تيراندازي نيروهاي انتظامي ضد شورش جمهوري اسلامي در اوشنويه، روز دوشنبه دست كم چهار نفر كشته شدند. در تهران روزنامه جمهوري اسلامي نوشت: سي دي هايي كه تصاوير خاكسپاري شوانه را منعكس مي كند و به طور گسترده در منطقه پخش شده تقلبي است. علي جوانمردي روزنامه نگار كرد و كارشناس امور كردستان در مصاحبه با راديو فردا اين نوشته جمهوري اسلامي را تكذيب مي كند. علي جوانمردي: واقعيت اين است كه در پي واقعه قتل آقاي شوانه در شهرستان مهاباد، توسط نيروهاي انتظامي جمهوري اسلامي شماري از جوانان اين شهر شستشوي جسد شوانه را فيلم برداري كردند و گوشه هايي از اين فيلم را در سي دي هايي كپي كرده و در سط ساير شهرستان هاي كشور پخش و توزيع كردند. در اين سي دي ها صورت مسله شده و آثار شكنجه بر روي پشت و پارگي شكم و ماليده شدن پوست پشت شوانه در حين بسته شدن به پشت ماشين كاملا پيدا است. همين مساله خشم مقامات جمهوري اسلامي را در منطقه برانگيخته و نيروي زيادي را درواقع صرف كشف منابع پخش و توزيع اين سي دي ها نموده اند، اما واقعيت اين است كه اين سي دي ها كاملا درست است و در مهاباد فيلم برداري شده در حين شستشوي جسد شوانه. علي جوانمردي: افراد زيادي در مهابات بازداشت شدند كه هنوز اتهام آنها به روشوي مشخص نيست. بيش از 200 تن از بازداشت شدگان هنوز در زندان هاي جمهوري اسلامي هستند. البته نه در مهاباد، به شهرستان هاي اطراف منتقل شدند. آيا در ميان اين جوانان كساني باشند كه عامل كپي كردن اين سي دي ها هستند يا نه، تا به حال مشخص نشده. آنچه كه مشخص است، اين اين سي دي ها فعلا پخش شده در سطح وسيعي و بسياري از مردم توانستند آنها را مشاهده كنند. علي جوانمردي: انعكاس تصاوير شستشوي جسد شوانه در سطح شهرستاني هاي غرب كشور وجدان هاي مرم و ساكنين اين مناطق را بيش از پيش جريحه دار كرده و به همين دليل در گردهمايي ها و اعتراض هايي كه به همين منظور در شهرستان هاي مختلف برگزار مي شود، اين مساله به وضوح پيدا است و شعارهايي كه در پشتيباني از مردم و تظاهركنندگان مهاباد داده مي شود. علي جوانمردي: بله كاملا درست است. شهرستان اوشنويه از روز يكشنبه به اين سو شاعد سلسله اعتراض هاي گسترده مردم اين شهر عليه جمهوري اسلامي بوده. از نخستين ساعات صبح روز دوشنبه 25 ژوئيه بيش از يك هزار تن از مردم اوشنويه به خيابان ها ريختند و با سر دادن شعار با مردم مهاباد اعلام همبستگي كردند. در جريان اين تظاهرات در چهار راه كارگر و بولوار انقلاب نيروهاي گارد ويژه ضد شورش به سوي مردم تيراندازي كردند كه در جريان آن چهار تن از تظاهركنندگان جان خود را از دست دادند كه اسامي آنها به اين شرح است: حيدر عبدالله زاده، عمر اميني فرزند شيخ محمد، ابراهيم فرزنده حاجي قادر و رسول معروف به رسول ديوانه اهل روستاي عالي آباد. OTTAWA (CP) - Critics are calling on Prime Minister Paul Martin's government to take a tougher stand with Iran in the case of a Canadian woman who was tortured and killed in an Iranian prison two years ago. The federal Conservatives and the freedom-of-speech group PEN Canada made the appeal Tuesday - a day after an Iranian court rejected demands for a new investigation into the case. "A Canadian woman is falsely arrested, tortured, raped and murdered and the Iranian regime won't even investigate," said Stockwell Day, the Tory foreign affairs critic. "And what do we hear from our Government? Only the sounds of silence." Day said Martin has remained woefully silent on the issue and urged the prime minister to demand that the case be properly investigated. "Anything less than that shows dereliction of duty in defending the security of Canadians." Kazemi, 54, a Montreal-based photojournalist with Canadian-Iranian citizenship, died in July 2003 - 17 days after she was jailed for photographing a demonstration outside Tehran's Evin prison. Iran's judiciary charged a low-ranking intelligence official, Reza Ahmadi, with unintentionally killing her during interrogation. Ahmadi was cleared of the charge at trial last July, with the court citing a lack of evidence. On Monday, an Iranian appeals court rejected demands for a new investigation into whether Kazemi's death was premeditated murder. That effectively laid the case to rest in Iran. Nobel peace laureate Shirin Ebadi, who leads a team of lawyers representing Kazemi's mother, said the judiciary hastily buried Kazemi to cover up signs of torture. Mohammad Seifzadeh, another lawyer, said there was no hope of justice from the Iranian judiciary. The lawyers will bring complaints about those allegedly involved in causing Kazemi's death to international organizations if demands for a fair trial are not met, Seifzadeh said. PEN Canada on Tuesday called on Ottawa to take strong action in the Kazemi case and that of imprisoned Iranian journalist Akbar Ganji. In a letter, organization president Constance Rooke called on Martin to urge Iran to end the impunity surrounding Kazemi's murder and to free Ganji. "Both underwent inhumane mistreatment at the hands of officials in Evin prison," Rooke wrote. Foreign Affairs Canada has criticized the court ruling on Kazemi. "This dismissal illustrates once again that the Iranian justice system has neither the capacity nor the will to confront the perpetrators of the brutal murder of Zahra Kazemi," spokeswoman Marie-Christine Lilkoff said Monday. She said Canada's policy of "controlled engagement" toward Iran will continue as Tehran has not taken steps to launch a credible and independent investigation into Kazemi's death. She added that Canadian officials were present at Monday's hearing but no foreign journalists or diplomats were allowed into the courtroom. "Only a proper investigation and trial of the guilty party or parties, as well as the return of Mrs. Kazemi's remains to Canada in accordance with her family's wishes, can bring any satisfaction in this case." Meanwhile, Ganji has been on hunger strike and said Iran's supreme leader, Ayatollah Ali Khamenei, would be happy to see him die in prison. He was jailed in 2000 after reporting on murders of five dissidents by Intelligence Ministry agents and hospitalized last Monday after a 45-day hunger strike left him severely weakened. Kazemi Petition: Expel Islamic Clerical Regime of Iran from The UN For Killing a Canadian Photojournalist, and Call For Free Referendum In Iran! Tehran, Iran, Jul. 26 � Protests erupted once again this morning in the Kurdish town of Oshnavieh, northwest Iran, following clashes between angry people and State Security Forces on Monday, during which two anti-government demonstrators were shot dead by police. Monday�s demonstration in Oshnavieh, during which participants chanted anti-government slogans, was in support of the more than 200 people arrested in the nearby towns of Mahabad, Piranshahr, and Marivan, according to local Kurdish websites. Two individuals identified as Heydar Abdollahzadeh and Amr Amini were killed when State Security Forces opened fire on protestors. The killings led to the latest round of street-battles between angry people and agents of the SSF on Tuesday. Tuesday�s edition of the state-run daily Jomhouri Islami stated that �trouble-makers� were responsible for the unrest, adding that two people were wounded, but it did not mention the killings. Tehran, Iran, Jul. 28 - Iran�s security forces gunned down a woman protestor in the Kurdish town of Oshnavieh, northwest Iran, on Wednesday during clashes between residents and government forces. The woman was identified as Jamileh Khezri and was among three protestors killed by state security forces in Oshnavieh during the unrest. On Monday, two anti-government demonstrators were shot dead by police, according to local residents. Monday�s demonstration in Oshnavieh, during which participants chanted anti-government slogans, was in solidarity with the more than 200 people arrested in the nearby towns of Mahabad, Piranshahr, and Marivan, according to local Kurdish websites. The two killed were identified as Heydar Abdollahzadeh and Amr Amini. Tehran, Iran, Aug. 03 � On Tuesday, July 26, plainclothes agents from the intelligence directorate of Iran�s Islamic Revolutionary Guards Corps took 18 detained Kurdish men from the restive towns of Baneh and Marivan to a barren location and, after a violent rough-up, forced them to strip naked and walk back to their towns. The Revolutionary Guards were trying to intimidate young people in this restive area of western Iran into silence after days of anti-government protests that have spread to several towns and cities. But the brutality and humiliation inflicted on the Kurds have only inflamed an already tense situation. The day after the 18 men were beaten and stranded, angry Kurds seeking revenge attacked police patrols in the region killing five agents of Iran�s State Security Forces. Tensions have increased dramatically in the area since the events of July 26 and there have been several other violent attacks on agents of the SSF in recent days. In a bid to contain the situation, the local authorities claimed this week that the perpetrators of the crime were Kurdish dissidents posing as Revolutionary Guards, who wanted to �incite people against the Islamic Republic�. As could be expected, the belated attempt to calm down the anger of local Kurds has not been successful and anti-government protests are continuing in different parts of the region. Tehran, Iran, Aug. 03 � Violent clashes erupted between young people and security forces in the Kurdish town of Saqqez, northwest Iran, and a prayer hall and vehicles belonging to the police were set on fire on Wednesday, according to witnesses. The windows of several banks were shattered as people threw sticks and stones at agents of the State Security Forces in Saqqez, situated in the province of Kurdistan, a hotbed of anti-government protests. The latest clashes come in the wake of a series of protests that have swept Kurdish towns and cities in Iran for the past weeks. Dozens of protesters have been injured or arrested by government troops in several towns. The semi-official daily Jomhouri Islami, which is close to Supreme Leader Ayatollah Ali Khamenei, warned in its Wednesday issue that �certain people are trying to bring turmoil to western Iran in coordination with foreigners�. �There are hidden hands at work to create chaos in the country through a well-planned coordination�, the daily added. It also reported �suspicious propaganda activities� against the theocratic regime in the south-eastern province of Baluchistan. Today�s unrest in Saqqez started at Oqab Square just before noon as angry protestors, who were in their hundreds, attacked a local Bassij post with sticks and stones. The Bassij are paramilitary Islamic vigilantes loyal to the Supreme Leader. Protestors then split up into small groups attacking various government buildings including the governor�s office. The commander of the State Security Forces in Saqqez was also beaten by protestors. Special anti-riot units of the Revolutionary Guards were brought in to put down the unrest and a number of demonstrators were arrested. Tehran, Iran, Aug. 03 � Iran�s State Security forces opened lethal fire on protesters in the western town of Saqqez from a military helicopter on Wednesday, eye-witnesses reported. Anti-government protesters set fire to the town�s principal prayer hall and vehicles belonging to the police on Wednesday morning. Various government buildings including the governor�s office were also attacked and the commander of State Security Forces was beaten by protestors. A government agency, Bonyad Panzdah Khordad, was completely ransacked. Witnesses reported that women took part in great numbers during today�s clashes with the security forces. One witness described how several women attacked policemen who had detained a teenage boy and freed him. In Hahlou Square, protestors chanted �Down with Khamenei�, referring to Iran�s Supreme Leader Ayatollah Ali Khamenei. In an attempt to contain the unrest, agents of the SSF opened fire on protestors. There were reports of several people being killed by SSF gunfire. By early afternoon, at least 30 people had been arrested. Today�s unrest in Saqqez started at Oqab Square just before noon as hundreds of protestors attacked a local Bassij post with sticks and stones. The Bassij are paramilitary Islamic vigilantes loyal to the Supreme Leader.